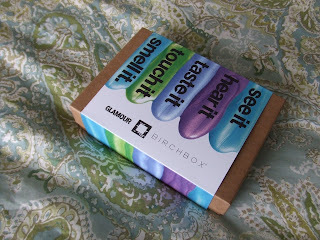 For Mother's Day, I got a subscription to Birchbox. It's a subscription service that delivers samples and the occasional full sized product right to your door each month. I LOVE cosmetics samples, so this is the best thing for me. I do love the boxes. everything comes nicely wrapped. It makes a great gift. Everything unwrapped. The mascara looks to be full sized! The tint was a little orange for me, but it might be cool mixed with my moisturizer...dunno. I'll try it at least once. I'm kinda excited to try the Blinc mascara. Its supposed to be those little tube thingies...we'll see. And I LOVE the mints. Chocolate and mint...what could go wrong?! (well, ok. A LOT could go wrong. But they are good.) I haven't tried the fade "fluide" yet, but I'm getting my hair colored next weekend, so I'll give it a run then. The perfume is really fresh smelling, and I think I like it. I don't really know if I'll ever need the earbuds...but hey, win some, lose some. 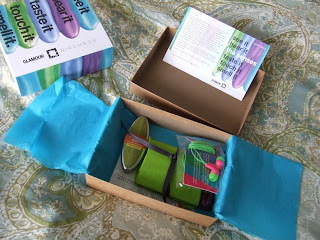 The earbuds are adorable but they don't work well at all, I was kind of bummed!